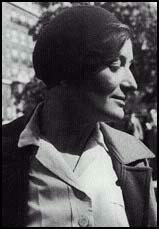 Dorothea Nutzhorn (Lange) was born in Hoboken, New Jersey, on 26th May, 1895. At the age of seven, Dorothea contracted polio which left her with a permanent limp. After her German born father abandoned the family, Dorothea assumed her mother's maiden name. Lange studied at the New York Training School for Teachers but changed her mind and decided to become a photographer. She worked in a Arnold Genthe's studio before studying photography under Clarence White at Columbia University. In 1918 Lange moved to San Francisco and the following year established her own portrait studio in the city. Lange joined the California Camera Club where she met and influenced by the work of Consuelo Kanaga, a radical photojournalist with theSan Francisco Chronicle. Lange's business was very successful until the Economic Depression that began after the Wall Street in 1929. followed. Shee now turned her attention to social realism and her photograph of a group of unemployed males, White Angel Breadline (1932), brought her to the attention of national critics and in 1934 Williard Van Dyke wrote an important article about her work in Camera Craft. In 1935 Lange was invited by Roy Stryker to join the the federally sponsoredFarm Security Administration. This small group of photographers, including Esther Bubley, Marjory Collins, Mary Post Wolcott, Arthur Rothstein, Walker Evans, Russell Lee, Gordon Parks, Jack Delano, Charlotte Brooks, John Vachon, Carl Mydans, and Ben Shahn, were employed to publicize the conditions of the rural poor in America. 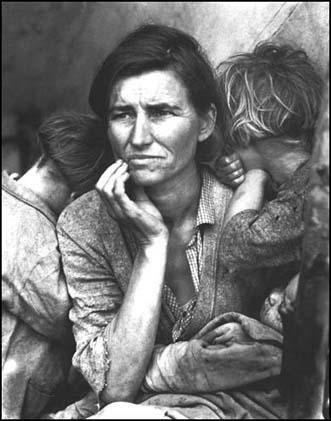 Over the next few years Lange produced several notable photographs such as Migrant Mother (1936). During this period Lange met Paul S. Taylor, a sociologist at the University of California. Taylor invited her to accompany him on his studies of migratory workers. Their book, An American Exodus: A Record of Human Erosion, appeared in 1939. In 1942 Lange was hired by the War Relocation Authority to document the internment of Japenese-Americans during the Second World War. She was also employed by the Office of War Information (1943-45). Lange also covered the United Nations Conference in San Francisco for the State Department. After the war Lange did several assignments for Life Magazine including Three Mormon Towns (1954) with Ansel Adams and Death of a Valley (1960). She also made photographic tours of Asia, South America and the Middle East. Dorothea Lange died of cancer on 11th October, 1965, just before the opening of her major retrospective exhibition at the Museum of Modern Art in New York City. (1) In December, 1998, Peter Lennon of The Guardian interviewed Katherine McIntosh, the girl hiding shyly behind Florence Neil's right shoulder in the picture, Migrant Mother. I was about five years old when the photograph was taken. We were on the way to a camp at Nipoma to work picking peas, but the peas had frozen over. We camped under a kind of lean-to we carried in the car. I remember a lady came and took photographs. My mother was about 34 at the time. She had earlier lost two children, a little girl aged six and a boy who was still-born. She had five children by my father, Leo Owens, who died before I was born, and three more by Jim Hill, my step-dad. Ma is exactly as the picture showed, except that she had a great sense of humour, which doesn't show. She was beautiful. She had long hair and I can remember when I was in high school, aged about 12, I had to to get up at 4am and fix her hair in rollers. The stoic image of my mother is true to her. When she was pregnant, she would continue working in the fields until she started labour. Then she'd go home and have a baby and in no time - a week or 10 days later - she would be back out there, working. If there was something wrong with you in those days, you didn't survive. She finally quit work in her seventies. My mother died of cancer, aged 80. Last September the US Post Office issued a stamp with the picture on it. But they did not even invite us to the launching. In October a copy of the picture with Lange's writing on it was sold at Sotheby's in New York for $244,500. What upsets us is that people are making money out of our mother's pain. But we are proud that she has become a part of history.